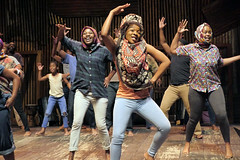 Award-winning South African theatre company Isango Ensemble has won worldwide acclaim for vibrant productions that reimagine the classics in inventive new contexts. 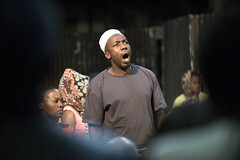 Previous productions include U-Carmen eKhayelitsha, The Magic Flute – Impempe Yomlingo and A Christmas Carol – Ikrismas Kherol. For A Man of Good Hope they turn to the true story of a Somali refugee’s journey through Africa, as told in Jonny Steinberg’s 2015 book. Asad Abdullahi was eight years old when his mother was murdered in front of him. He fled war-torn Mogadishu and journeyed through Africa in search of a better life, eventually finding his way to the outskirts of Johannesburg – but his troubles didn't stop there. Isango re-creates Asad’s journey through a colourful score drawn from music of different African traditions; its cast of artists, from different stages in their careers, tell his story of unfailing hope in the face of incredible odds. The performance lasts about 2 hours 30 minutes, including one interval.